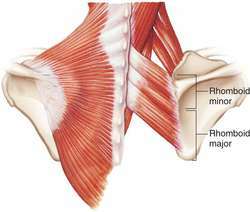 a muscle of the upper back below and parallel to the rhomboideus minor. It inserts into the lower half of the medial border of the scapula. With the rhomboideus minor, it functions to draw the scapula toward the vertebral column while supporting it and drawing it slightly upward. Compare latissimus dorsi, levator scapulae, rhomboideus minor, trapezius. Bunlar trapezius, serratus anterior, rhomboideus major ve minA[paragraph]r ve levator skapula kaslaridir. Important musculature required for the performance of the seated row exercise that are not included in the LifeModeler default model are the rhomboideus major and minor and the rotator cuff group (supraspinatus, infraspinatus, teres minor and subscapularis).